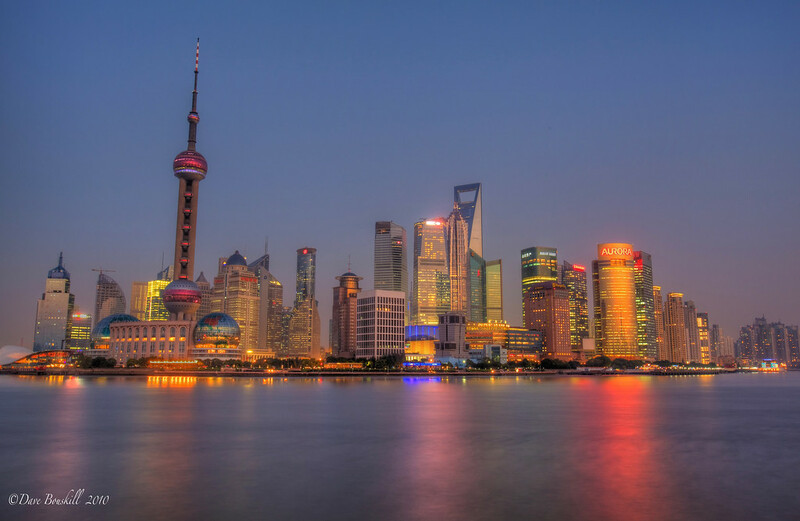 Shanghai has the most spectacular skyline in the world and the best view is from the Bund which which runs along the western bank of the Huangpu River. From here you are treated to the view of Pudong, one of the newest cities in the world. It is hard to believe that 20 years ago, this was all farmland. China decided that it wanted Shanghai to take over as the epicentre of China. I am sure that it will soon take over Hong Kong as the financial centre of the country. Get there early as the crowds get heavy with photographers scrambling for a spot for the best view. When the sun goes down, the city lights up and it is spectacular. 34 Responses to "Shanghai: A Twilight skyline from The Bund"
I visited Shanghai during Natinal Day (October 1) and it was great! So many happy Chinese celebrationg and waving flags in Nanjing Road…also liked the view from the Bund and the athmosphere. I stayed at Peninsula Hotel Shanghai, right in fron to Huangpu River during my last trip to Shanghai. I can witness the panoramic view even from the room. It was exactly same like the photo. That is awesome. I’m glad that we captured the view as it actually looks. We wanted to show people just how beautiful Shanghai is at night. Amazing pic. Makes me wish I’d spent more time in Shanghai. Wow! Really Beautiful. I like the color of the city. Beautiful shot. I absolutely loved the Bund. I also enjoyed it in the early morning without the crowds. I love this city very much want to visit this city again and again.. Agreed Indigo Airlines, it is certainly one of the most exciting cities to visit in the world. I would LOVE to go there – so gorgeous and interesting. This is the one place in China I really want to visit. Hi Andrea, it is a very cool place for sure. One of the coolest cities in the world. We really enjoyed our time in China, we’re looking forward to going back to explore more. Great photo! I usually see HDR has sharper colors, but I love the soft yet punctuated shot here! Thanks Dina, it has been fun working with HDR, learning as I go and playing around with different techniques. I love the site!! I was surfin the twitter feeds and found you. I work at a similar site and just wondering if you had any tips on how to best increase traffic? Hi Dan, you can contact us at our contact page. Or you can also check out our advice section on our home page. https://theplanetd.com/category/travel-blog-advice It has a bunch of articles about how to build a better blog. Here you’ll find https://theplanetd.com/8-ways-to-promote-your-travel-blog that is always a good one for building traffic. Cheers. Beautiful shot Dave! Love the water and the colors! Gorgeous pic. Shanghai fascinates me and is high on my list of must-visits. Probably just got pushed a notch higher after seeing your photo (and will help convince my photography-mad husband that it is well worth a visit!). Your husband will love photographing Shanghai. The Bund itself is gorgeous too a mix of old and new architecture. Beautiful photo, and extra fortuitous that you happened to get a cloudless/smogless Pudong skyline! You are right James. We were very lucky with our time in China. Being there in December offered up a lot of clear nights and days. Cheers! Hi Samuel, thank you so much for the compliment. We haven’t been to Seoul yet, but are looking forward to seeing its skyline. Asia has some of the most magnificent modern architecture. Cheers and thanks for stopping by! Gorgeous shot, I never get tired of this skyline, yeah I believe Shanghai is already taking over Hong Kong, much more vibrant, here it’s impossible to get bored, I’m so going to miss this city! Hi Angela, it is difficult to choose. Both Skylines are impressive, but Shanghai is definitely more interesting than Hong Kong. These are two amazing cities. Great photo. Curious, is this an HDR photo? HI Kris, yes it is HDR. Cheers. Great picture! I lived in Shanghai for several years and miss visiting the Bund! I’m sure a lot has changed since I’ve been there though. I can imagine how much it must have changed. China is changing rapidly I don’t think anyone can keep up. Well the Shanghai skyline is indeed gorgeous! Very impressive photograph. . . very impressive! Hi Kirk, Where I was standing was by chance. I knew about the amazing Shanghai skyline but I didn’t know where to capture it. I walked along the boardwalk looking for what I thought would be the best vantage point and waited for the sun to go down. After that, there were a ton of other photographers joining me. That is something we loved about China, everyone loved to take photos.